In UK, the first laminated gatefold cover was printed by Garrod and Lofthouse. The time in between the decision on how the cover should look like and the actual manufacturing was probably very short. They had no time to wait for the Patent to be registered so they had to put the "Patent Pending" text next to the name (http://www.stonesondecca.com/4A11_SKL4955_Beggars.html). 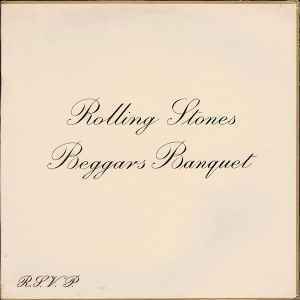 Beggars Banquet was released at the end of 1968, when the mono production in UK was at the end. This is why it is more common to find this text on stereo cover. For the above reason, the text "Patent Pending" identify the very earliest UK mono cover. The earliest matrix known for the mono version end with -4A (side 1) and -2A (side 2). mono, Decca, but I also have the stereo UK import London label-which is not listed here, the best sounding version. Cheers. I have this exact Monarch pressing version but mine has the original lavatory cover wrapped around the white artwork. I wonder if these came with the lavatory paper cover and many many of them lost it since it detaches pretty easily. Just finished playing this all the way through right out of the sleeve. Flat, quiet and static free. This is an excellent reissue. It is about as good as can be. I've been recently listening to my 2nd pressing copy Rolling Stones* - Beggars Banquet, in fact right before playing this new version. This is maybe better. The timing is correct on this pressing. Before 2008, there was a recording speed error when the masters were first made and it went out uncaught until then. It was 47 seconds longer than it should have been. So the pitch is slightly different. I had already changed my rip of the Rolling Stones* - Beggars Banquet to the correct time so I have already heard the difference before now. Not earthshakingly different, but noticeable when playing with the different speeds on an A / B studio comparison. Definitely a worthy release. Been listening to this material since it was brand spanking new 50 years ago. Worthy of replacing a worn out early pressing and even the crappy CD versions put out over the decades. The Stones have been victim of shabby engineering for way too long since the mid 70's, regarding their earlier stuff, the ABKCO stuff. The pressing, jacket, artwork and overall presentation are all top shelf. As it should be. please, could someone upload pictures, matrices and other info of this US version/pressing ? Is this the speed corrected (fast) version of the album? How many more re-pressings ? When is anyone say it is more then enough ? Do you remeber how many versions of Miles Davis "Kind of Blue" are issued untill now ? I must say after hearing the firs mono press...first japan...remastered versions and so on that this version is the best one...Idon't know how/how did it ..how/who they cut the lp but it sounds great...captures the music perfect in any way ...dark and groovy and so on.Perfect version!!! Brought this one home yesterday and am quite pleased with this. Blues Rock / Roots Rock / Americana by Satchamo.